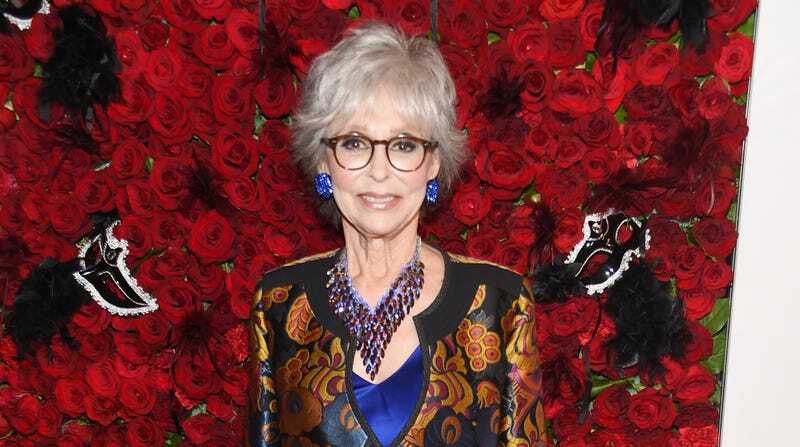 In what we’re just going to assume is partially a shot at Netflix over the cancellation of One Day At A Time, this year Peabody Awards will present Rita Moreno with the Peabody Career Achievement Award. This comes from Deadline, which reports that Peabody’s executive director Jeffrey P. Jones said in a statement that “Rita Moreno is a unique talent who has not only broken barriers, but whose career continues to thrive six-plus decades after her acting debut.” Jones also highlighted her “passion for children’s programming and important social issues.” The award will be presented to Moreno on May 18. Of course, Rita Moreno winning awards isn’t a new thing, and this Peabody trophy will be going on an already-crowded shelf. Moreno has previously received The Kennedy Center Honor for lifetime achievement, won the Screen Actors Guild Life Achievement Award, got a Presidential Medal Of Freedom from George W. Bush, and a National Medal Of Arts from Barack Obama. She also happens to be an EGOT winner, so now we’re going to consider it a PeaEGOT to account for this Peabody award.